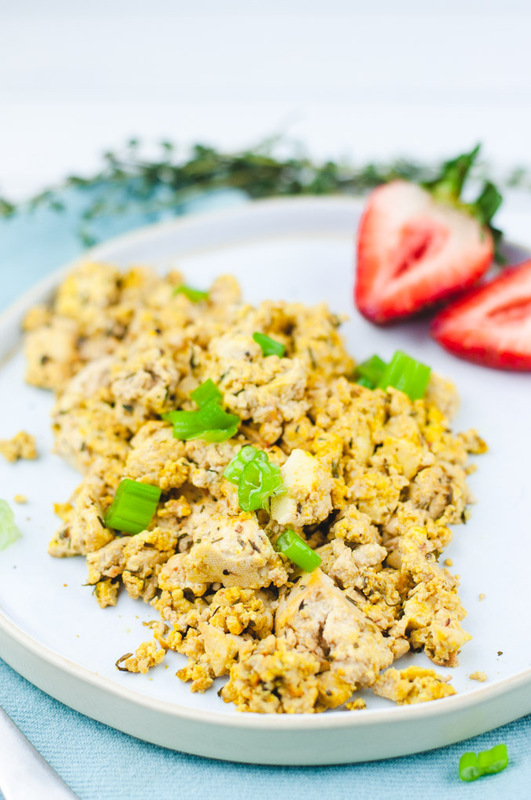 This easy tofu scramble is flavored with nutritional yeast, soy sauce, and dry herbs. It’s easy to mix up in just 15 minutes! Tofu is a great source of plant-based protein. It’s easy to scramble up for breakfast, lunch, or dinner! Many enjoy it as a vegan replacement for scrambled eggs at breakfast, but it’s just as good coated in savory spices and enjoyed with lunch and dinner. Tofu is probably the most common denominator of my diet. 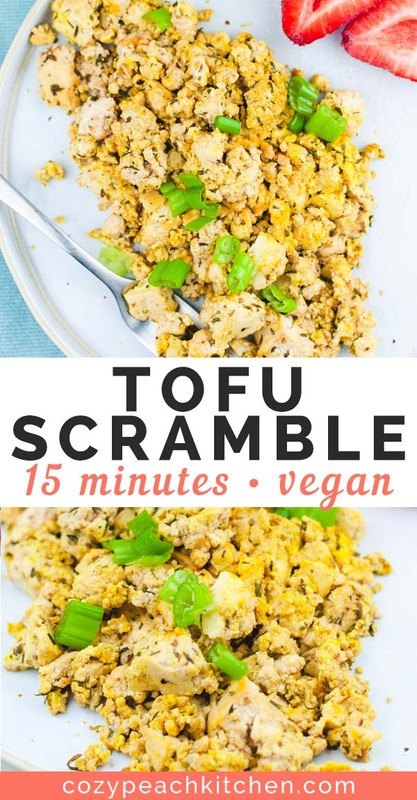 And tofu scrambles are probably the most common tofu recipe that I make. As I’ve said many times on this blog: I meant to share this recipe sooner. I mean… much sooner. As in, I remember writing this post a few days after setting up my blog. 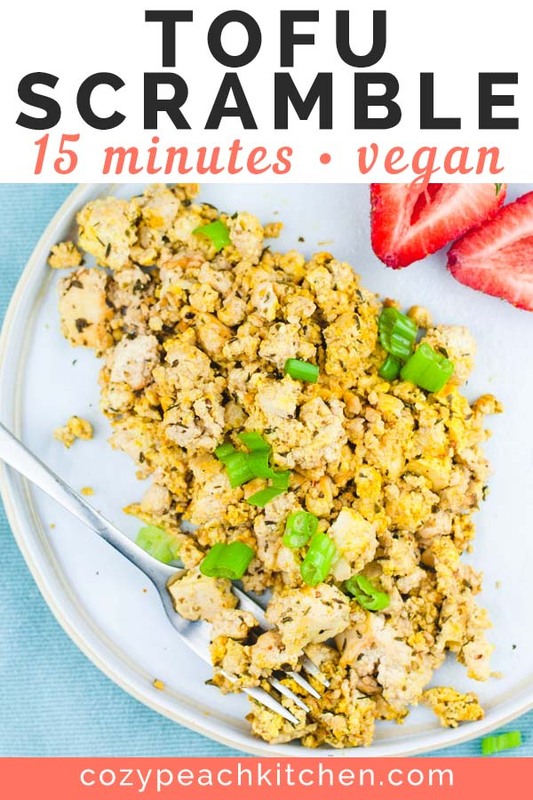 Well, it’s almost a year and a half later, and this tofu scramble recipe is finally ready to share. 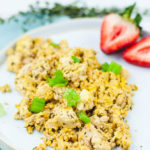 My favorite part about tofu scrambles is that they don’t have to be for breakfast. While classically enjoyed as a vegan breakfast option, tofu scrambles are also tasty in burritos, with potatoes and veggies, or on toast. You don’t have to limit this recipe to just one meal! 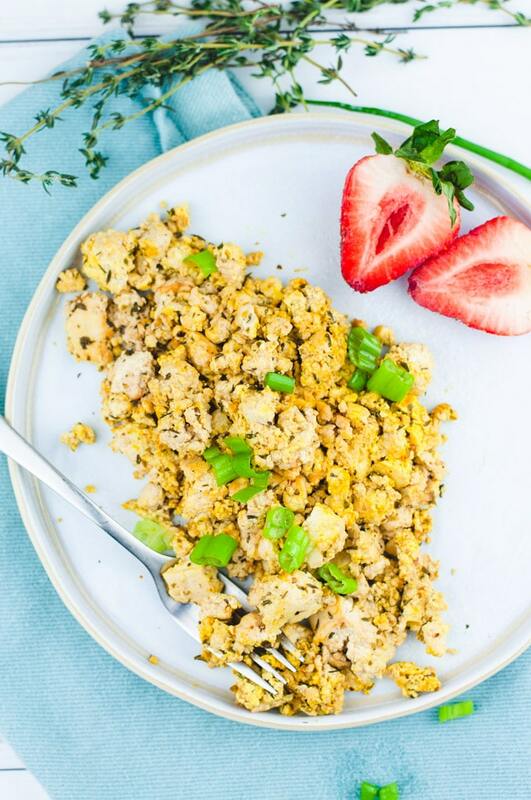 Why make a tofu scramble? Soy sauce + nutritional yeast = umami party! The two most important ingredient in my go-to tofu scramble (other than tofu, of course) are soy sauce and nutritional yeast. Both of these ingredients are umami, which basically just means they taste savory. This umami taste is found in meats like pork and beef, but also occurs in mushrooms, tomatoes, and soy. Recipe tip: Choose low sodium soy sauce to cut down on sodium, or opt for tamari if you’re gluten-free. Nutritional yeast can be found at most grocery stores in the health food section. 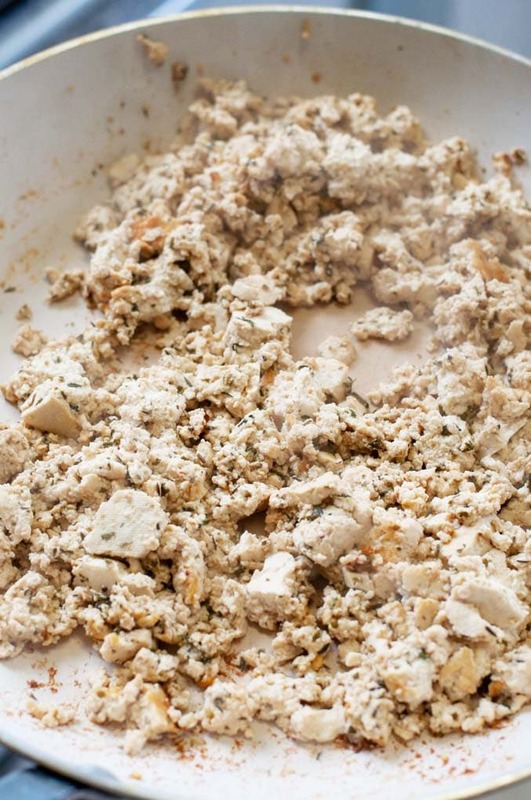 Make your tofu scramble marinade. In a small bowl, combine nutritional yeast, soy sauce, water or veg broth, and dry herbs. 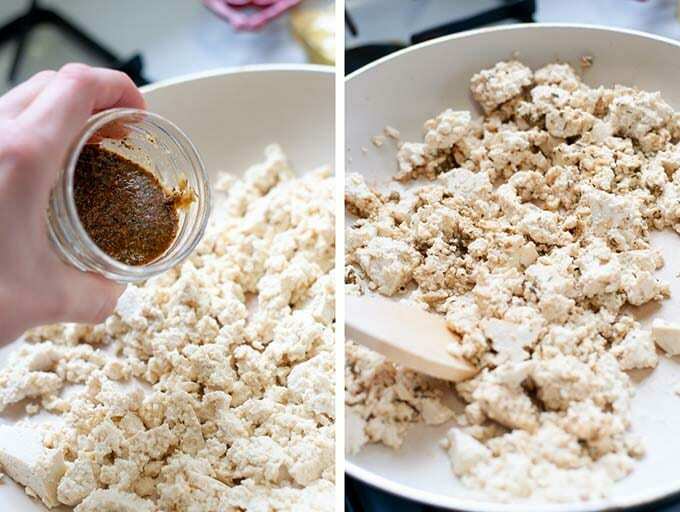 Crumble the tofu into small pieces using a fork or your fingers. You can crumble it directly into the hot skillet. Add tofu to oiled cast iron or skillet over medium heat. Add the marinade, stirring to evenly coat the tofu. Cook over medium heat until the tofu starts to brown, stirring every so often to prevent burning. This should take a little under 10 minutes. When almost done, coat the tofu in remaining nutritional yeast. Cook a minute longer. This will get the tofu extra flavorful! Looking for more vegan breakfast recipes? 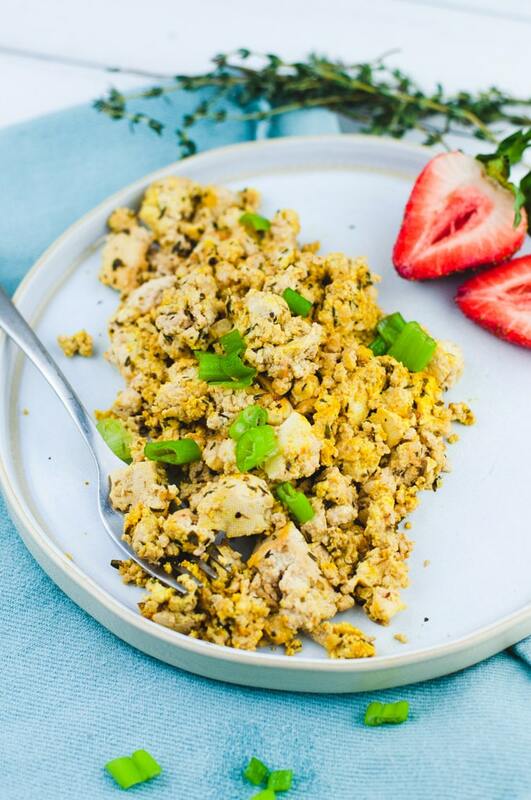 This flavorful tofu scramble is made with nutritional yeast, soy sauce, and dry herbs. It can be enjoyed on its own, in a burrito, or for breakfast. In a small bowl, stir together the marinade: 1 tablespoon nutritional yeast, soy sauce, water/veg broth, dry herbs and optional turmeric. Heat a large cast iron or non-stick skillet over medium heat. Add the olive oil. Using your hands or a fork, crumble the tofu into bite sized pieces. See photos for reference size. Add tofu to the hot pan. Drizzle tofu in the marinade, stirring to coat evenly. Cook over medium heat until the liquid is evaporated and tofu starts to brown. This should take a little under 10 minutes. Once almost done, sprinkle with additional 1 tablespoon of nutritional yeast and cook a minute longer. Add fresh ground black pepper and taste for seasonings. Enjoy! Fresh parsley, thyme, and oregano can be used in place of dry. Use 1 and 1/2 teaspoons fresh herbs for each dry herb.